Good photographs can transport you in your mind to the scene they depict. With Photographs of Valle Crucis Abbey you will find your imagination taking you back to the Middle Ages when life was supposedly simpler and less hectic than our modern times. But as peaceful as the scene looks now the violence of those far off times has left its scars and the granduer that was once the Cistercian Abbey can only be imagined. Photographs of Valle Crucis Abbey will help you to appreciate the skill of the stone masons as they toiled for years to build this home for the White Monks of North Wales. We start at the West Front with its elaborate carving around the doorway and the rose window high above, shown in the large photograph on page 3. Going South and turning back towards the ruin, the West Front and the South Aisle wall lead into the South Transept, and turning, the Sacristy and Chapter House come into full view. A little closer and the Sacristy and Chapter House are across the ruins of the Cloister. Just the foundations of the Monks Dining Hall remain now. The foundations of the Day Room for the Lay Brothers can be seen leading back to the West Front on page 6. Moving further east the Chapter House looks quite well preserved in the photographs on page 7. The East Wall with its majestic windows to allow the sunrise onto the High Alter reflect the past glory of the Abbey and the roof over the Sacristy seems rather incongrous beside the roofless chapels. 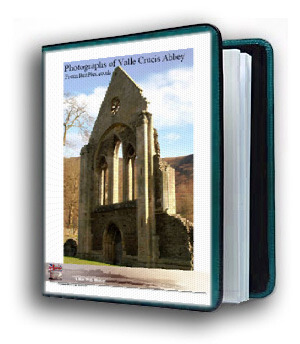 Photographs of Valle Crucis Abbey is a PDF eBook available with 11 high resolution photographic images costing just �5.47 which is less than 50p an image. Photographs of Valle Crucis Abbey is delivered in PDF format and is viewable on any computer. All you need is Adobe Reader which is available free and already on most computers. To print a photograph zoom in to fill the Acrobat Reader window and print current view.